A new wave of activism has swept the nation this past year, and inspired people of all ages – including millions of youth like you – to rise up and speak out. Want to join the momentum but not sure how to get started? Check out this easy list of tips to get you moving. Tip #1: Never doubt your voice is needed. Know who’s brought forth awesome things like civil rights, voting rights, and the weekend? PEOPLE LIKE YOU. There’s no expert team of crack activists waiting to make all good things happen. It’s inspired, passionate people like you. You can and will figure out everything you need to know as you go. (And we’ll give you a jump start below). Tip #2: Lead with your story and why you come to the cause. Spend some time thinking about why you care about your issue. Practice articulating that. Share your story with friends and your community. Your story is incredibly powerful. It motivates and inspires others. It makes issues real for the public. And it breaks through to decision makers. There’s a reason why all cultures love stories: they touch the heart and soul – i.e. the places all great actions and ideas originate from. Tip #3: Practice your values. No you don’t need a PhD in social change to make great things happen. But do spend some time making sure your work reflects the values you stand for. The “DNA” of your work is really, really important. For example: are you organizing a group to speak out about immigration? Then make sure you’re taking the lead from immigrant communities and activists. Are you speaking out about gender equality? Then does your group reflect the groups you’re advocating for? Building space and processes that are welcoming and inclusive are worth every bit of effort ten times over. It’s much more important you do your work right – i.e. build a leadership team of diverse voices that really reflect communities affected by an issue – than it is to pursue quick wins you can achieve with your immediate friends. Real change comes when we’ve changed the game, and build people power on the long term. Yes, the world is on fire and there’s so much to do. But you can’t do it alone. A very early step is to identify who’s also passionate about this issue. Invite them to coffee. Start to build a team that’s eager and willing to do something. It doesn’t matter if they have experience; their passion is all you need! One tip for bringing people in: hold a social or educational event to discuss the issue – for example organize a speaker or hold a film screening – and ask for people to sign up to get more involved at the end. JOIN US IN WASHINGTON, D.C. THIS SUMMER! Tip #5: Map out your issue. – the problem you’re concerned about. Let’s use “gun violence” as our example. Write those words in the center. – factors contributing to the problem, and their connection to the main problem. In our example, these could include: weak federal laws around guns (list them out); weak state laws around guns (list them out); lack of supports for students in school (i.e. funding for counselors, restorative justice programs, etc. ); and so on. IF you’re passionate about guns, you don’t have to look far for this information, as there’s so much public conversation around the issue right now. But knowing how to sketch out the problem is important for future work too – this is how you begin a campaign on any issue. Finally, identify a few of these pressure points you can influence. Tip #6: Choose what you can do. Unless you’re a superhuman, and/or have a huge team, you likely can’t you likely can’t tackle all of the factors contributing to the issue. You’ll need to make choices. A handy way to choose is by using the SMART tool. SMART reminds us to choose work that’s strategic, measurable, achievable, realistic and time-bound. It’s wonderful and good to reach for the sky with your work. But you’ll also want to choose things you can do, well, in a reasonable amount of time. Remember: steps towards things are great too! You’re not going to change the world or pass sweeping new pieces of legislation overnight. But you can educate x# of people, register y# of people to vote, etc. etc. Tip #7: ID who has the power to make those things happen, and what will influence them. Flesh out who has the power to make the change your seeking. These are called your targets. Then ID what will influence those people. Those are your tactics. Are you trying to get a law in place, or get additional funding for something? Your targets will likely be your elected leaders, and they’ll respond to tactics like lobby visits, calls, letters, and voting. Are you trying to get new policies in place in your school? 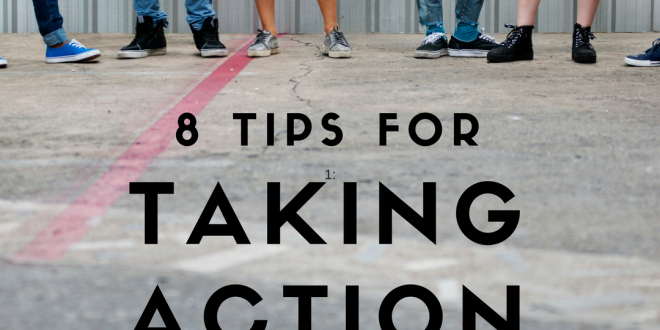 Your targets might be the principal or school board, and your tactics could include providing research and poll data, having meetings with students and parents, a popular action like a walkout, etc. It’s always a good idea to try to find common ground with your targets before you consider more aggressive tactics or direct action. Sometimes, a target just needs to hear that people care about an issue, or have new information or resources, to decide to take action. Tip #8: Make your plan and getter done. At this point you have your story, your team, your values, your objectives, your targets and your tactics. Plug those into a workplan that’s doable and inspiring for your team. Remember to distribute the work and build leaders. Be strategic in what you try to achieve, and wise about choosing your tactics. Remember to keep sharing your personal stories, and articulate the story of your group, too. And finally, never ever doubt that you can do great things, and that the world needs you! We look forward to your changing the world, doing great things, and inspiring us all. Go team!